"Pack your bags, Watson; we leave for the Continent in less than ninety minutes." It’s 1888. A perfumed letter featuring a doubly encoded message arrives at 221B Baker street London, a snowy December, 1888. A disastrous Ripper investigation has left 35-year-old Sherlock Holmes in a deep depression and back on cocaine. The newly married Watson is summoned urgently to 221B to rouse his friend. Nothing works until the arrival of an intriguing encoded letter from a beautiful French singer, Mlle. Emmeline La Victoire. I rather enjoyed MacBird's addition to the Holmes repertoire. As it has been a couple of years since I've read the original Conan Doyle Holmes stories, I was quite happy with the tone and language in Art in the Blood. It felt authentic, and as though it could fit right in. Watson and Holmes felt like dear friends whom I hadn't seen, but could just pick right back up with. And the interactions between the two of them were wonderfully done, that perfect blend of nostalgia and new. 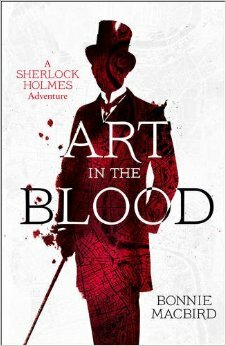 Admittedly, the crime did have more of a modern feel than I recall from the Victorian era Holmes stories; however, it is still a fun adventure through a world which has become increasingly popular thanks to Robert Downey Jr and Benedict Cumberbatch's portrayal of Sherlock Holmes.